Just in time for the holiday shopping season: the Triple Threat Kit. 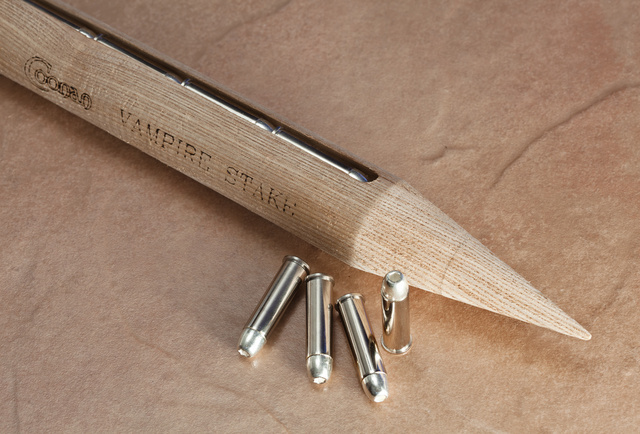 Stakes for vampires, silver-plated bullets for werewolves…which also work on zombies the old-fashioned ballistic way. Ammunition is loaded pretty hot and works best in Coonan pistols and strong revolvers like GP100. We got close to 1600fps from the 5″ autoloader. You get eight rounds, enough for a full magazine and one in the chamber. These would make a pretty memorable present, I think. This entry was posted in ammunition, humor and tagged 357Mag, novelty, undead, vamire, werewolf, zombie. Bookmark the permalink. Humm….not sure about the effectiveness of silver-PLATED bullets on werewolves. Do they come in .40? 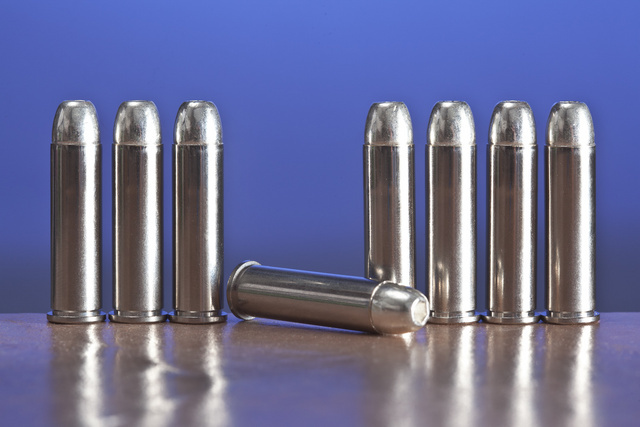 Silver plated bullets are AWESOME on werewolves and various other demons! 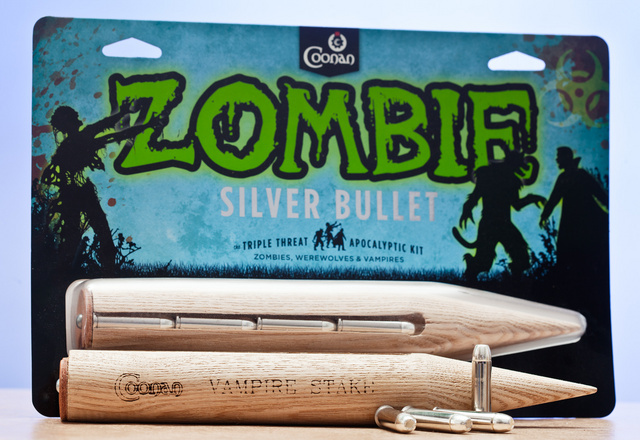 Coonan offers a QUADUPLE MONEY BACK GUARANTEE if any bullet fails to kill any Zombie (with a head shot) or Werewolf (any “critical mass” hit), OR if the solid wood (Minnesota Ash) Stake fails to kill a Vampire with a proper insertion (through the heart). WARNING: Improper use of the Vampire stake could lead to the creation of a new ASH HOLE!! Have you considered getting Larry Correia on board to help promote this in the MHI series? 1600fps means it would work great in my .357 Desert Eagle, too!